P-D-Y school board president Mike Ford called the Village of Delta’s agreement with NatureFresh Farms a joke. Delta Village Administrator Brad Peebles said NatureFresh will prove itself a benefactor to the village. 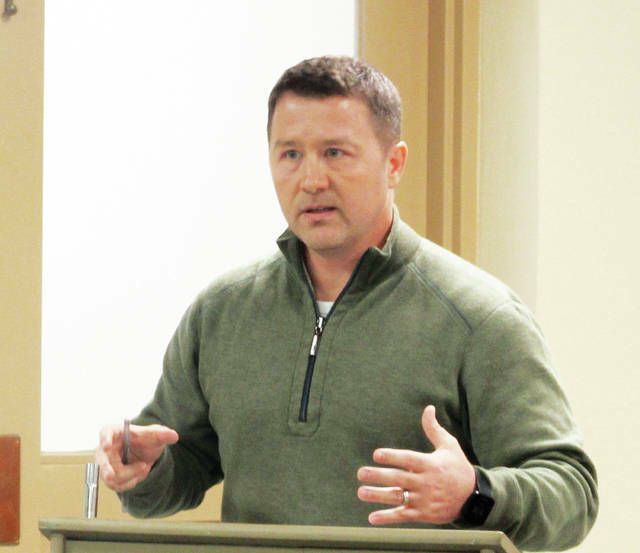 Following a public hearing Thursday, three members of the Village of Delta Board of Zoning Appeals agreed to table a decision on proposed housing at NatureFresh Farms until two absent members can review the feedback. And while village residents attending the hearing didn’t become overly-heated or disorderly, the zoning board, Village Administrator Brad Peebles, and NatureFresh representative Cornelius Neufeld got an earful. The community members expressed concern over foreign workers targeted for the housing and complained the village isn’t benefiting from the annexed company. Zoning board members Pat Ogg, John Krauss, and Michael Tanner were present; members Brian Parsons and Doug Eicher were absent. The meeting was also attended by Matt Gilroy, executive director of the Fulton County Economic Development Corporation (FCEDC). NatureFresh is requesting R-3 High Density Residential zoning within its M-2 General Industrial zoned parcel so it can build two on-site housing complexes and a soccer field, and turn a pole barn into a recreational facility. Each dormitory-style complex would cost $1-$1.25 million and would house up to 75 foreign employees. Peebles said 175 people currently work at NatureFresh’s Delta location, including 55 seasonal employees from Mexico, Guatemala, and Honduras working under a U.S. government H-2A visa. The location’s $4.46 million 2017 payroll provided the village with $66,458.54 in income tax revenue. Seasonal workers presently live in three houses at the Delta location, and in a rental house on County Road 7-2 in York Township. With the completion of two housing complexes on NatureFresh property the on-site houses would be razed and the company would stop leasing at the rural Delta address. In September of 2017, NatureFresh President and CEO Peter Quiring said because people in Fulton County are unwilling to perform labor-intensive jobs a labor shortage ensued at the Delta location, forcing production shutdown three months of the year. Delta resident Randy Brian opened the public statements by confirming the H-2A workers pay income tax and that NatureFresh uses about 160,000 gallons of treated village water daily. 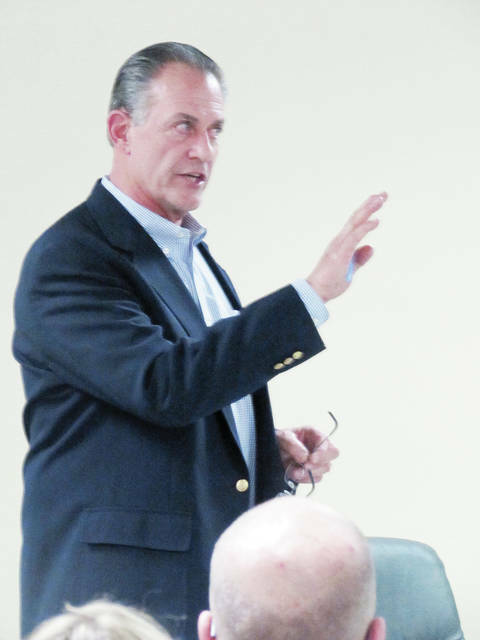 Neufeld drew laughter when he told village resident Tom Tuck that drugs tests are not regularly administered to employees, including those under the H-2A visa. Tuck said he assumes those workers live in countries that illegally transport drugs to the U.S.
“It would seem like (drug testing) would be something that you guys would want to have on a continuous basis,” he said. Neufeld said housing inspections routinely take place, and no evidence has been found of the workers using drugs. He also dispelled a rumor that county residents are refused jobs at the company if they can’t speak Spanish. Resident Jerome Cook asked about police protection in the event of fighting among H-2A workers. Peebles said the workers he’s met “are very cordial, very respectful, and very thankful to have the job.” He said they understand they’ll be sent home permanently for causing trouble at work or with local law enforcement. Asked if the company would pay property tax on the proposed housing complexes, Peebles said because NatureFresh is categorized under agricultural use it may not have to. He said the Ohio Tax Commission would decide. Mike Ford, Pike-Delta-York Board of Education president, complained that Delta removed a possible $3 million donation from NatureFresh to the school district when the village annexed the company property in 2015. He said village administration should focus on encouraging local people to apply for NatureFresh positions. On Friday, Peebles slapped back, saying Delta residents shouldn’t rely on the original agreement NatureFresh made with Fulton County and York Township, where the 175-acre property was located before the annexation. That agreement was predicated on the estimated value of the project’s construction and the possible donation to the school district over 15 years. When NatureFresh was annexed to the village a new agreement was made offering the company 100 percent abatement over 10 years and no obligation to donate to the school district. He said the village’s agreement with the Canadian-based company has been “severely misrepresented” by the P-D-Y school board. He also expressed disappointment in Mike Ford’s comments at the hearing. “I thought his actions and presentation were unwarranted and very unprofessional,” Peebles said. According to the Fulton County Auditor’s Office, in 2018 the P-D-Y school district received a $23,625.19 donation from NatureFresh representing the Phase One greenhouse project. Other NatureFresh donations given last year under that project included: Fulton County, $5,768.19; Four County Career Center, $1,301.69; York Township, $2,078.48; Delta Public Library, $989.75; and Four County Community Health District, $692.83. Peebles told resident Troy Johnson he recommends the village utilize a conditional use of the proposed housing complexes. He said it gives the village some jurisdictional control over the complexes should NatureFresh eventually no longer own them. Peeples also addressed concerns that living in on-site housing will deter the H-2A workers from contributing to the local economy. He said the housing proposal stems from fear and concern neighbors living next to the workers on County Road 7-2 have expressed over their presence. Peebles said Friday that NatureFresh “is unquestionably generating new income tax revenue.” He said the decade-long tax abatement the company was granted is a way of partnering to make it successful. Gilroy said the approximately $60,000 in income taxes Nature Fresh employees pay annually and the village water the company uses daily provides additional revenues to Delta. “(T)he FCEDC likes to hear that employers are considering expansion opportunities and opportunities that will include hiring more people and expanding the tax base,” he said.